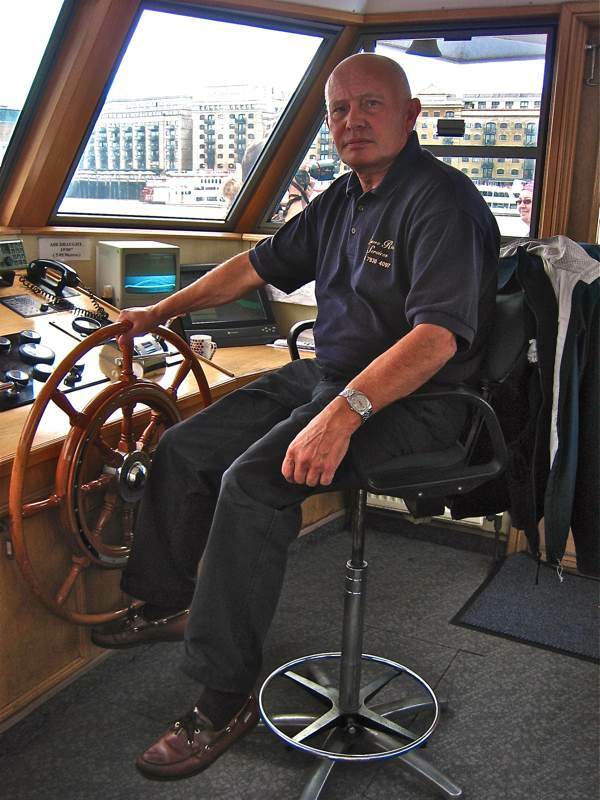 Waterman & Lighterman of the Thames, eighty-three year old Robert Prentice, is known as “Old Bob” to distinguish him from his son Robert Prentice, Waterman & Lighterman – who in turn is known as “Bobby” to distinguish him from his son, Robert Prentice, also Waterman & Lighterman. Even before Old Bob, there were two previous Robert Prentices that were Watermen & Lightermen on the Thames – his father and grandfather. And Old Bob was feeling especially buoyant when I went down to visit him at Blackfriars Pier yesterday, because seven weeks ago another Robert Prentice was born, adding a sixth generation to the roster. So although this “New Bob” may not even yet be conscious of the nature of existence, he has an extraordinary riverine inheritance awaiting him. We convened in the Old Pump House, a bizarre construction beside Blackfriars Bridge supported by stanchions from the river bed and here, in a cosy windowless room built like a cabin upon a ship, high above the brackish water of the Thames, Old Bob told me his story. “We are East Enders, from Wapping and the eldest son is always called Robert. In 1944, at age fifteen, I was apprenticed to my father Robert. I was a dogsbody. You got apprenticed on Tuesday and you went to work on Wednesday. You learnt quickly. The docks were being bombed, but you worked night and day. I was a young boy and it was exciting for me. I can remember St Catherine’s Dock burning for three nights, it lit up the sky like daylight. It was a very old dock, specialising in tea, ivory and spirits. We moved a lot of barges under oars then, my father was quite adept at it. The tide done your work for you. You’d come away on the ebb to go down along and come up on the flood tide. There are very few places where you could pull over the tide. 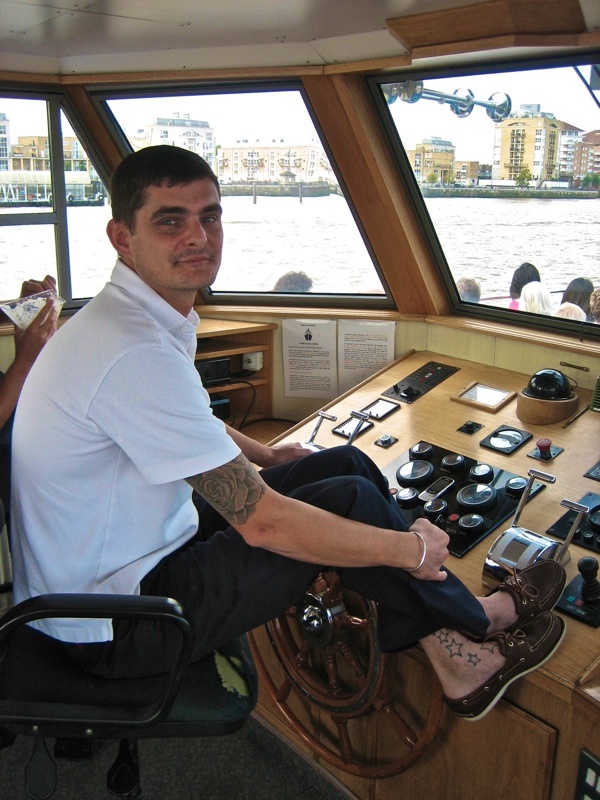 I worked for my dad until he went into the navy and I ended up on a sea-going tug. I sat an exam and got a licence which allowed me to work certain craft. It was only after I had served my time, five years, that I was fully qualified. At sixteen years old, you was like a man. You learnt to lie like a trooper. You seldom went to the office but you were always on the phone and radio. You was allowed to make up lies to get overtime. As lightermen, we considered ourselves the elite because we did our apprenticeship and we became freemen of the river once we had completed it. I wouldn’t know anything else. The river was bustling, like Piccadilly Circus then. It was a way of life to be perfectly honest, a beautiful life. The amount of different work you did, you might start at six in the morning at West India Dock and finish at ten o’clock at night at Tilbury. You mixed with lighterage all day long and you went socialising. It was a great fraternity. Lightermen were militant. We had a union meeting once a week and we always headed to the pub at the end of the night. 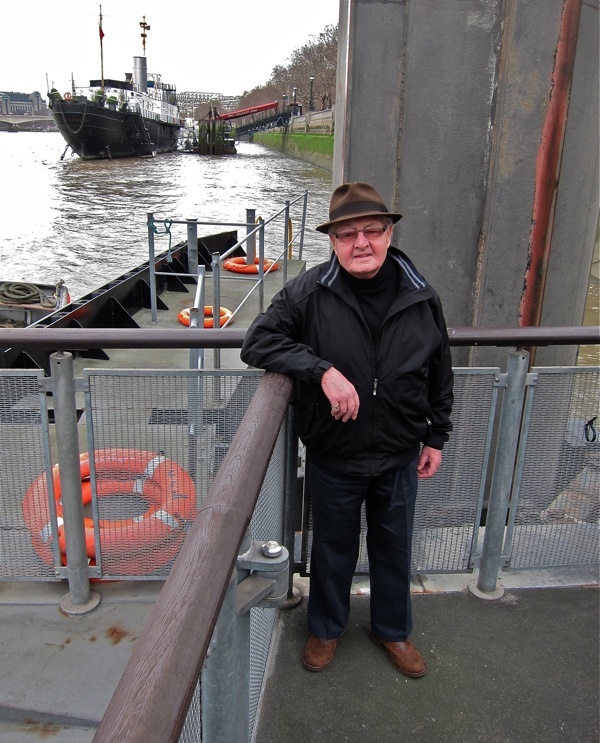 When Old Bob retired a few years ago, he had served more than sixty years on the Thames and seen the transformation of the docks from thriving port to complete closure. 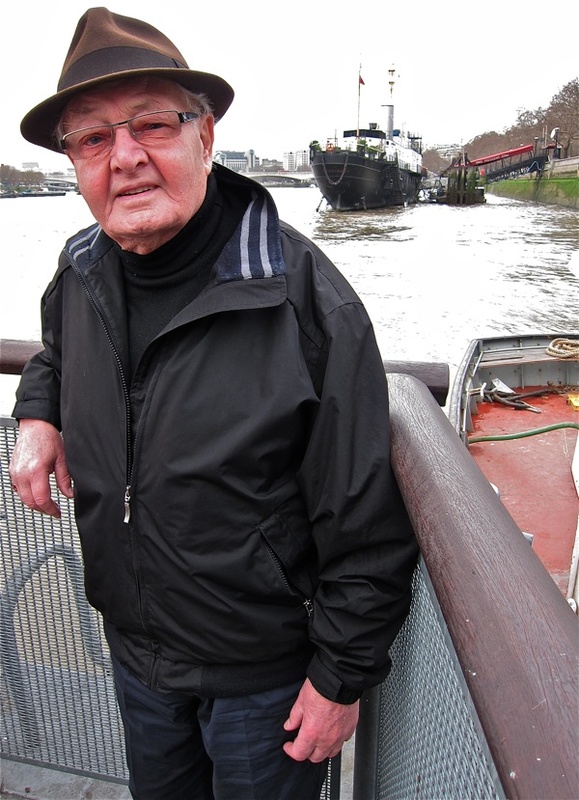 At the start of his career, he worked the lighterman side of his profession, moving cargo on barges, yet he finished as a waterman, skippering a pleasure boat, a line of work continued by his son and grandson today. At the beginning of the twentieth century, barges had sails and later auxiliary motors. When the Thames was “the silent highway,” barges were “driven,” never rowed, and the moorings were known as barge “roads.” Today, moorings with names like “The Heartbreak Buoys” recall the depression of the nineteen thirties when lightermen waited days there for work. Even in Old Bob’s time, a barge (known as a “lighter,” because it lightened a ship’s cargo) laden with one hundred and fifty tons of cargo could be driven by a skilled lighterman manipulating a single oar (known as a “sweep”) in expert relation to current and tide. We took a break from the Old Pump House and walked down onto the pier at water level, empty of visitors on this grey January morning. Below the level of the embankment now, we were in Old Bob’s territory, where the flood tide churned under Blackfriars Bridge. Bob described the wharfs that once existed between here and Tower Bridge, and I asked if he missed the life of the docks and the days of the busy working river. “It breaks your heart sometimes.” he admitted, peering out across the empty water at his memories of vessels long gone. Yet there was a chill on the deserted waterfront and Bob turned his back on it, his energy lifting as we climbed the gangplank to the shore. “I’ve become yuppie now and bought a flat!” he confessed to me with a blush, eager to return to his centrally-heated home in Wapping and await the latest snap of the newly-born Robert Prentice. 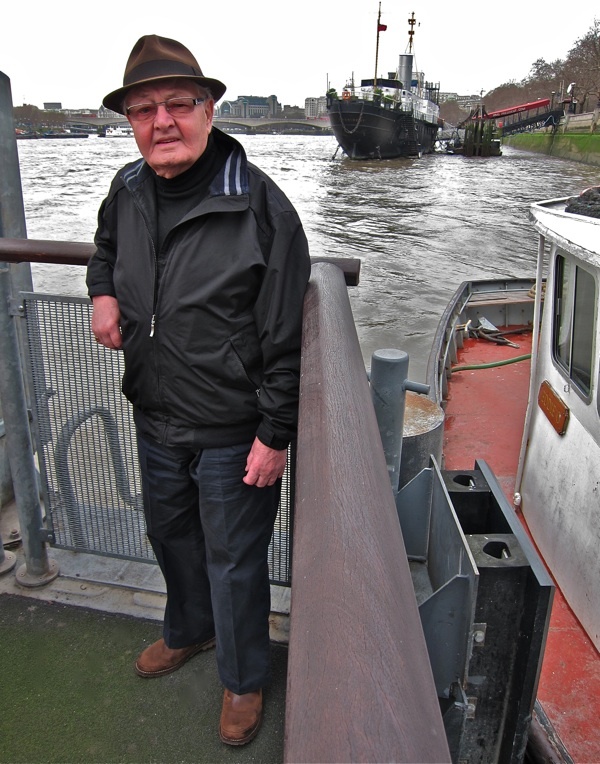 “Old Bob” has worked on the Thames for over sixty years. Lovely story.. the Thames has changed a great deal over the past 100 years! It was sad to see the docks go. If it was foggy you knew before you got out of bed by the sirens sounding all down the river. In the war it was a hive of activity. I remember seeing the battered aircraft carrier H.M.S. Indomitable being repaired in a dock beside the road to Woolwich ferry after her action in the Mediterranean. Great reading. My dad Fred Smith, like many generations before him (since records began) was also a Thames lighterman throughout the war years, and before and beyond, for Vokins; did you know him Bob? Also have several John Smith ancestors who were lightermen too. Wonderfully written and a wonderful story. Your father John Holder was my uncle (so also my mums) cousin. Uncle Jim and mum Joyce. On my fathers side – my uncle Len Milton is going to the funeral today. Just to let you know, I am a rower at Globe RC so the water is in the blood. We read your article with interest and are looking for a way to contact John Smith who posted here. His father, Fred Smith was a lighterman and worked aboard a tug named Vassal. We have bought Vassal and plan to restore her and would love to speak to Fred if he’s still with us. Could you pass my e/mail address on to Ann Holden. I was a very good friend of her farther John Holden when we both worked for Mercantile Lighter age. Nice one Bob. Like it. Thanks to Mark’s efforts, Vassal is starting to look great again in Waldringfield boatyard on the river Deben. I often sail on the Deben with another old timer, yacht Nancy Blackett, built 1931 and made famous via Arthur Ransome and Swallows and Amazons as the Goblin. I’ve sailed her up the Thames a few times too, great to visit my Dad’s old work waterway.